Summer is the best time of year for Broadway Rose Theatre. For during the summer, the company moves its productions from its New Theatre in west Tigard, to the Deb Fennell Auditorium at Tigard High School. Here, the all-musical company flexes its muscles and moves into a short season of large-scale productions. 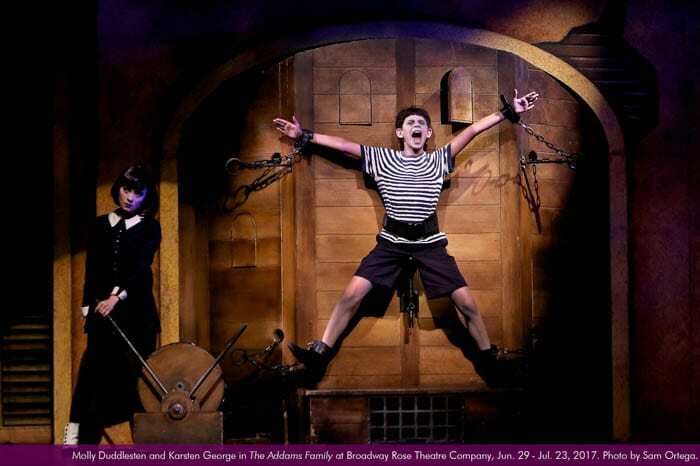 Broadway Rose’s summer opener, The Addams Family, a darkly weird, satiric musical comedy, is a production not to be missed. Based on characters created by cartoonist Charles Addams, the show features the usual suspects from the nuclear family (for those who remember the television show), an ensemble of ghoulish ancestors, a young man in love, and his unwitting parents from Ohio–22 actors in all, accompanied by an 11-piece orchestra directed by Alan D. Lytle. Written by Marshall Brickman and Rick Elice with music and lyrics by Andrew Lippa, the story revolves around Wednesday Addams (Molly Duddlesten), who stalks the stage dressed in black and armed with a crossbow. Think Katniss Everdeen with spats. She dreams of love, and of ways to torture her little brother Pugsley (Karsten George). She is head over heels for an all-American boy. Lucas Beineke (Colin Kane) is a young man who is not obsessed with death. They plan to get married. Wednesday thinks it’s a great idea for the two sets of parents to meet each other at a dinner party to be hosted by her parents Gomez (Joe Theissen) and Morticia (Lisamarie Harrison). As one can imagine, the dinner party does not come off as planned. So many things stand out in this show: big voices that more than fill the auditorium; an outstanding set, and costumes of various periods, all in a tattered off-white for the ancestors and black for the Addamses; satisfying choreography by show director Peggy Taphorn; and several outstanding individual performances. Bruce Lawson (Lurch), Karsten George (Pugsley), Isaac Lamb (Fester), and Amy Jo Halliday (Alice Beincke) rate special mention, as does the tight and high-energy script peppered with hilarious gags. The play runs through July 23, and is macabre fun for ages 8 and up. And next up is Gypsy, which opens August 3. Thanks for this. I loved this show!